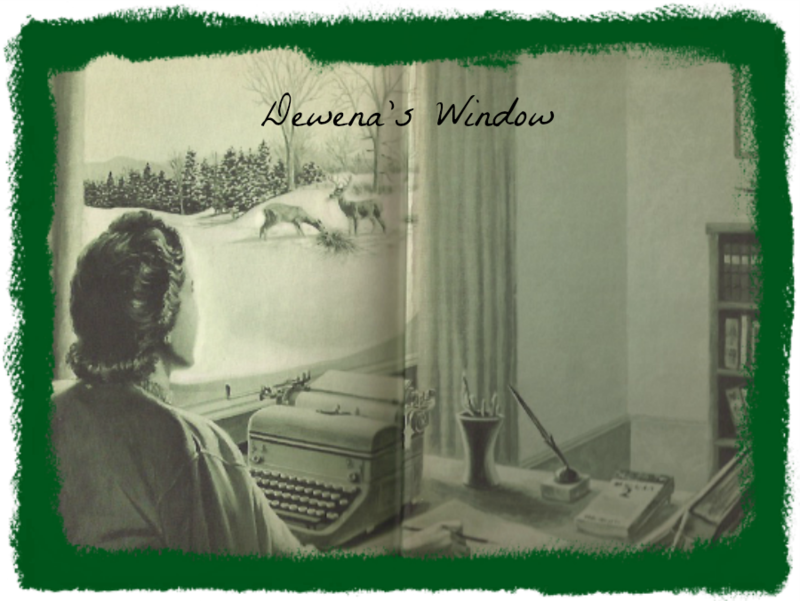 Dewena's Window: Does Mrs. Smith Get the Job? Does Mrs. Smith Get the Job? How do you like my new suit? I've been busy sewing a small business wardrobe all summer, but for my first job interview I spent all my birthday money on this oxford-gray flannel suit and the chamois vest and gloves. Do I look professional to you? A good suit is a must for business and I didn't trust my dressmaking skills enough to tackle a suit, but I've made three blouses I can wear with it and two jersey dresses. I think that will do until the paychecks start coming in. The twins are in third grade this year and my husband will be home working on his dissertation so it seems like the perfect time for me to find a job. Here goes, I don't want to be late for my interview. Keep your fingers crossed for me, please. The balding man frowned and stood up, holding out his hand, her cue to stand up too. "Mrs. Smith, I'm sure you were top of your college class when you graduated in 1940, but you have no real job experience since then. I need a girl with leadership skills, someone who commands respect from the girls who will work under her, someone who knows how to train other girls thoroughly. I'm afraid you..." He paused, turned both hands palm up and shrugged. "Then I am just the woman you are looking for, Mr. Williams." She stood up but looked him straight in the eye as she gathered her handbag and gloves. "I have been busy raising two children all while managing a house, even when alone while my husband was overseas in the Army. But I've also volunteered at the Red Cross two days a week, taught Sunday School to three-year-olds, mowed the grass so my husband could study for his degree on weekends after being honorably discharged. "I got up at 4 a.m. to cook breakfast and pack his lunch so he would be on time for the early shift at work before he attended classes in the afternoon. I have led a Girl Scout troop every year since high school when I won the highest award given by the Girl Scouts. "I do know how to train women under me. There's not a lazy bone in my body and now that my husband is through with classes and is writing his dissertation and my children are well into school, I am ready to pursue my own career." Her shoulders thrown back, she forbade herself to blush, or cry. "That sounds admirable, Mrs. Smith, it certainly does." He glanced at his watch and said, "But you have young children. They may be in school but who is going to take care of them when they get sick?" "My husband will this year, Mr. Williams, and after that when he is teaching at the university we'll make other arrangements." "But I can't be sure of that, can I? How do I know you won't decide that Johnny needs you if he breaks his leg on the playground or if Susie goes to the hospital with appendicitis?" "Maybe not, Mr. Williams, but then you can't be sure that every woman in your office won't come down with influenza at the same time or that the men employed here won't end up hospitalized with a serious illness. All I know is that I have two children who will need to go to college someday and I plan on seeing to it that they'll be able to." She decided to go on quickly since Mr. Williams looked at a loss for words. "That unmarried woman you're looking for, with no responsibilities at home? What happens when she falls in love and gets married and her husband is transferred? How can you be sure that I'm not a better risk than she is?" Mr. Williams shook his head, "You certainly are persistent, Mrs. Smith. I'll give you that and you've given me a new perspective on this, but...."
Okay, dear friends, now YOU get to finish my story. Does Mrs. Smith get the job or not? How would you end this story? 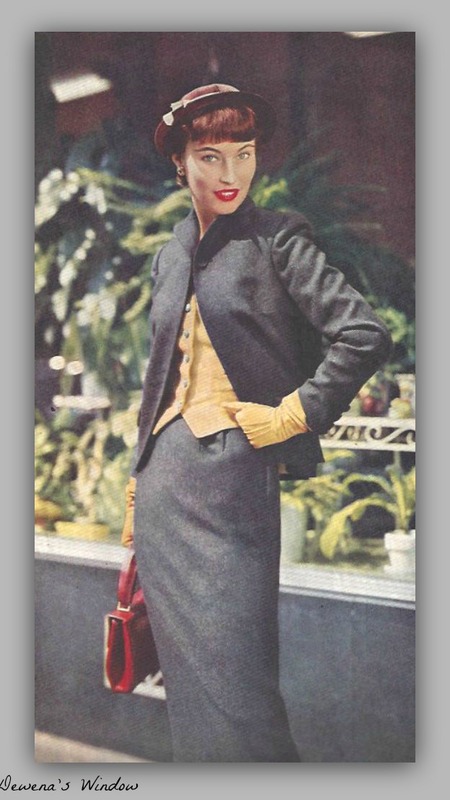 Mrs. Smith's suit courtesy of Ladies' Home Journal, August 1950. I love this Dewena....let's see, she threatens to sue his company for discrimination if he doesn't give her the job OR she threatens to call his wife and tell her they've been having a torrid love affair, every story has to have a twist, right??!!...LOL. 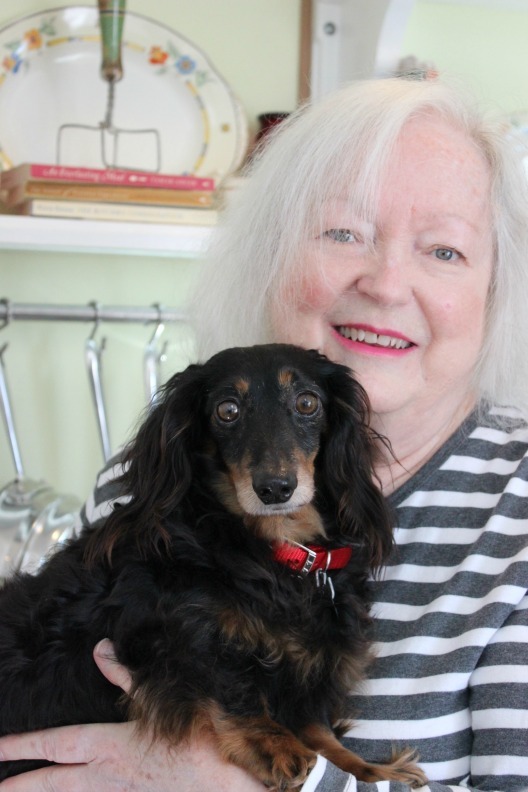 Sweet friend, the possibilities are endless and I love this story! She does get the job by having him dictate a letter (which she takes down in shorthand) and she transcribes it perfectly!! By the way, I do love that suit and wish we could dress that way nowadays...with some class and elegance. BUT, I would not wish the garter belt and hose on anyone!! :-) Love you!! What a honest, persistent lady Mrs. Smith is! I hope she gets the job and blesses the company with her abilities and her charming personality. 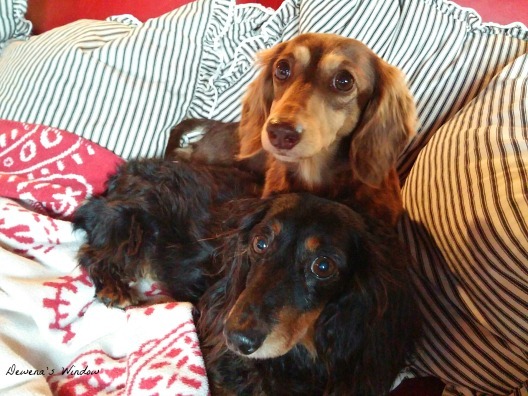 Love the pics of you with your two canine family members. wow - this is well-qualified person. But in 1950, women were very much discriminated against. I don't know if she got the job, but I surely hope so. My ending: She got the job, worked there for years and eventually owned the company. I like Jan's ending. But I'm afraid that 1950s men were not so clear thinking. Perhaps she was hired by another company and eventually took over the first company she applied at and became this man's boss! GREAT story, Dewena, I wanted more. And great suit. I wish we still dressed like that today. I love Jan and Lorrie's comments about her getting the job and owning the company or becoming his boss. Fabulous. Revenge is a dish best served cold. But I'd like to give this man the benefit of the doubt...and end it with her getting the job. She certainly made an awesome case and without a few forward thinking men willing to take a chance, women's rights wouldn't have gotten very far. So since she educated Mr. Williams and while he was absorbing his newfound view of women she took the opportunity to say to him while she pointed over to a desk with a view out the window - ..."I'll take that desk, thank you." I bet you have already finished this wonderful story, Dewena, and knowing you as I do, Mrs. Smith got the job and almost immediately worked her way up to the top! Heck, I would have hired her solely for the sharp suit she was wearing, as she was definitely dressed to impress! Now, if I were 'Ms.' Williams, the clincher, for me, would have been her assertive eloquence, so reminiscent of her spunky creator! Looking forward to reading the ending to this lovely short story, set in the past! I am sure with Mrs. Smith's persistence and good explanations of why she should get the job she will have landed it. Great story so far. Happy New Week sweet friend. I say she will get the job! I enjoyed reading the story, and I've enjoyed reading everyone's thoughts and comments too. PS Love your photo's on the side of your blog. I think she gets the job, but decides to take an offer elsewhere for double the pay and amazing benefits. The bald man - oops, I mean Mr. Williams - learns a valuable lesson in attitude adjustment as Mrs. Smith's new employer is a direct competitor of his, who, with Mrs. Smith's help soars to the top of HER company's success, eventually making Mrs. Smith full partner and leaving Mr. Williams in the dust! No, she didn't get the job. But she did get a job at another company, where she rose through the ranks and became a member of the senior management team. A few years later, Mr. Williams got fired, and applied for a job at her company. Imagine his surprise when he learned that she would be his boss! Great post, Dewena! She gets the job and works for several years when she decides that she will get her Master's degree in a new field called Women's Studies. Her tuition is provided because her husband is now a full professor. 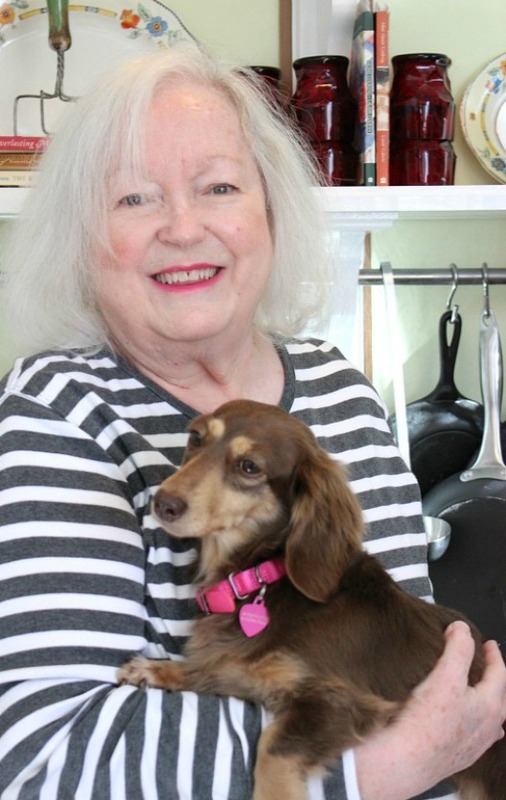 She makes a career change and she ends up counselling women who are re-entering the workforce.